"I can get even tuning of robots done with the Pro-face's HMI. How amazing! No more device for robots only is required." 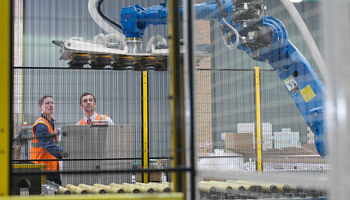 Business need: More robots and image sensors have been installed on production sites, but each of them needs their dedicated device, so they are not easy to use. Production has been increasingly automated on production sites and lots of robots and image sensors have been introduced. But dedicated devices such as a teaching pendant are required for monitoring status of robots or tuning. Also, it's necessary to install a dedicated device for watching images of an image sensor and then check a range of devices. That's not effective. "What is the most helpful is to utilize dedicated connection sample screens for the Pro-face's HMI. They are easy to use because a range of features necessary for adjusting robots are included." Pro-face's solution：　Download Pro-face's sample project file and just connect. The Pro-face's HMI can be connected to robots and image sensors and status of each device can be monitored on an HMI unit installed on a production site. Dedicated connection sample screens for a range of devices are available and they can save you the time and effort necessary to create screens. If you want to know more detail, please download the following PDF.